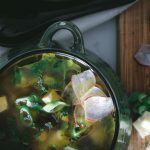 Soups are always my go to.. when i want something filling, when its winters and i want a bowl of warmth, when i want to go on a health spree ,soups offer a very healthy, guilt free and wholesome option , when i’m sick a warm bowl of soulful soup is my health. 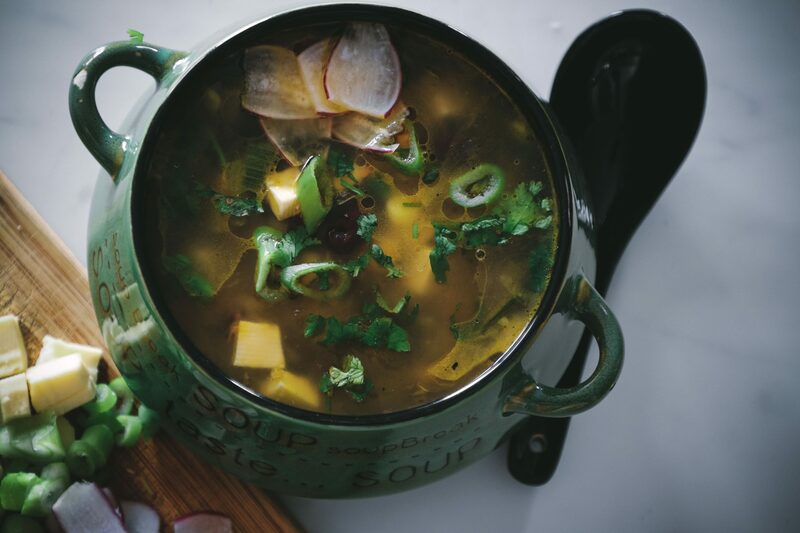 Soups are so very versatile. You can have it as a snack, a mid day meal, or it can be a complete meal in itself. 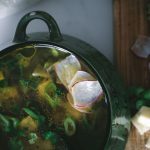 If you are still not convinced on having soups, check out this article on why should be soups your best friend! Im sure you will be adding soups to your daily diet. Why i loooove this soup? 1.The top reason being i don’t have to think which vegetable soup to make. i can just throw in most of the veggies that i have in fridge. 2.This is not the mushy soups, and i do not need a blender for this. This is a clear vegetable soup, as the name suggests, and it has a nice crunchy texture. This ones for the days when i think ,i should be having more and more veggies, without having much carbs and fats. This is perfect, in the sense that it has hardly any fats, and it is so very light on my stomach, and yes it is full of all the goodness and crunchiness of fresh vegetables and beans , and has a huge punch of flavours. I also love having this when i’m a bit under the weather. It is so warming and comforting. It is really healthy for kids as well. 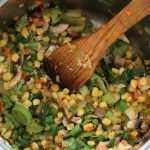 Serve them the soup, adding the only the vegetables they like.When i serve this to my daughter, i only add sweet corn, and paneer in her soup bowl. Even though i cook the soup with all vegetables, but in her bowl she sees only her favourite veggies. 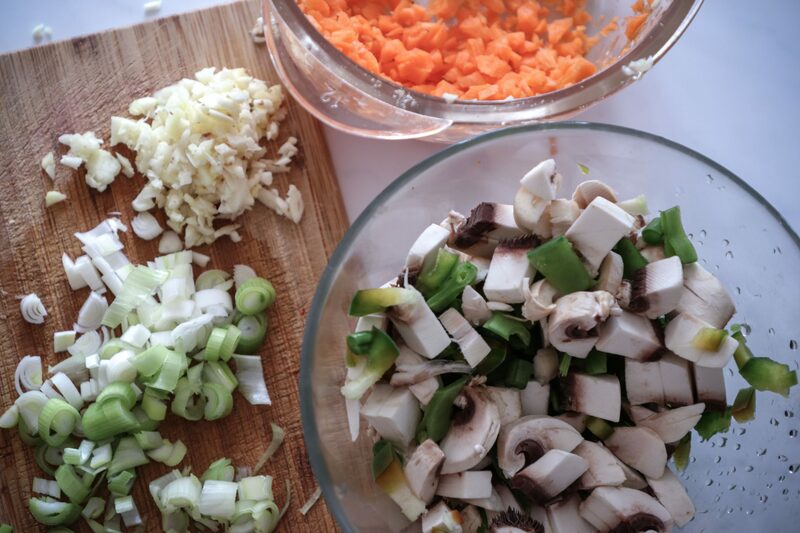 The soup will have the flavour of all veggies, but the kids won’t have to crunch on beans, pepper and peas.So, lesser fuss over having to eat the vegetables for them. 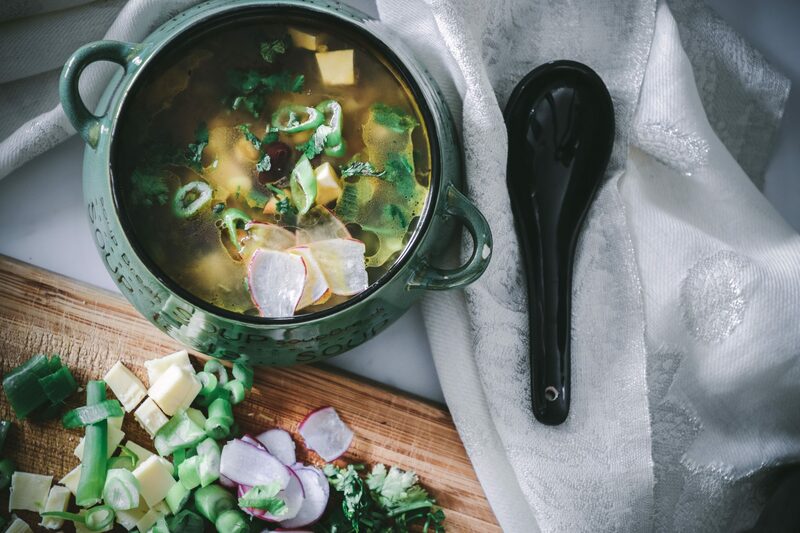 You can use any vegetables you like in this soup, and for proteins you can add beans, chickpeas , paneer or tofu. If you prefer non vegetarian option, you can add chicken in it. This is a clear soup, with a crunch in every bite. If you prefer something which has a more smooth and creamy consistency, check out the creamy mushroom soup recipe on the blog. In my recipe, i have used, mushrooms , spring onions, leeks, sweet corns, mangetout beans/peas , french beans , cooked red kidney beans , and green capsicum along with paneer cubes (Indian cottage cheese) .You can replace paneer with tofu, if for some reason you cannot use paneer. To add that punch and flavour , i have added loads of fresh garlic and ginger, to sauté the vegetables. This is a vegetable soup, so of course any vegetables can go in it. You can add peas if you like. Tiny pieces of sweet potato, or squash also go well in this soup. 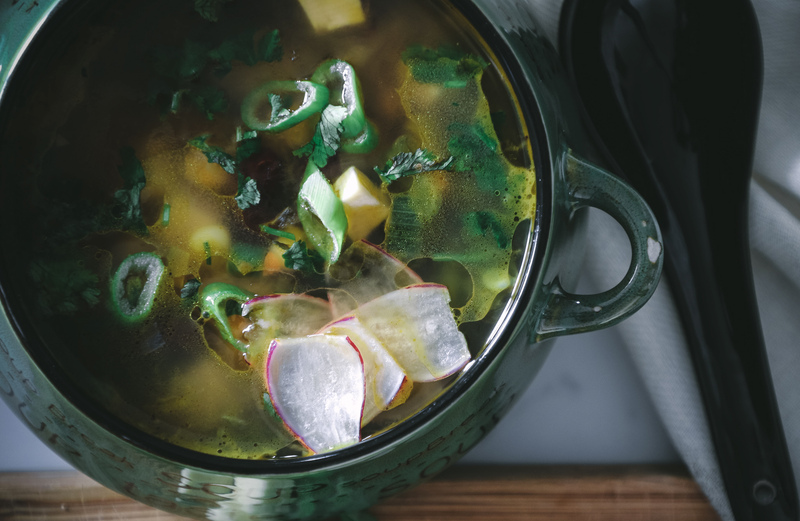 Spinach leaves is another way of adding greens to this soup. You can avoid adding mushrooms if you are not a mushroom lover. Adding leeks, and mangetout peas is also optional. These can be omitted, if you do not have them. 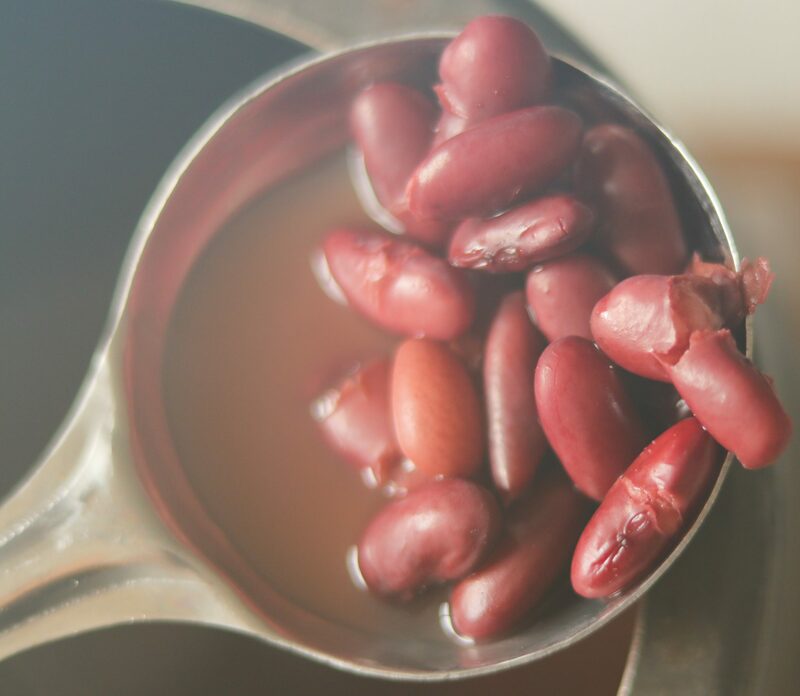 The red kidney beans are again optional, but they add loads of fibers and proteins, and they make the soup filling. 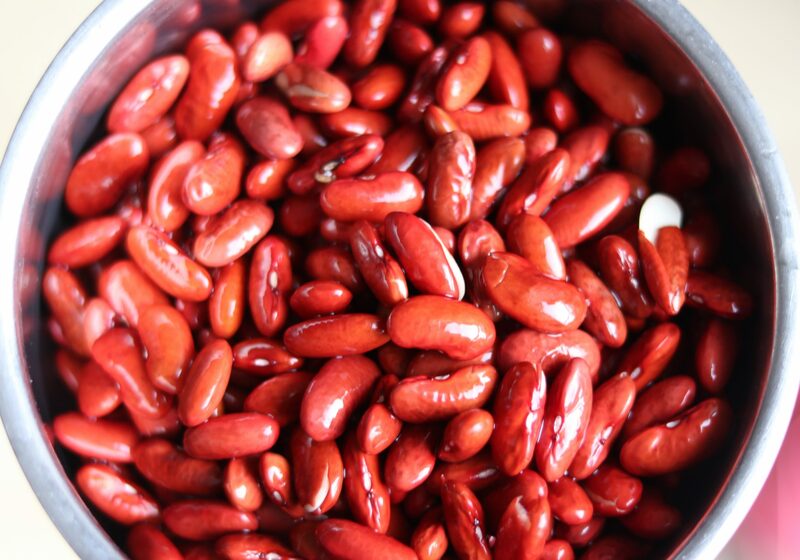 The red kidney beans can be replaced by cooked chickpeas, or black eyed peas. 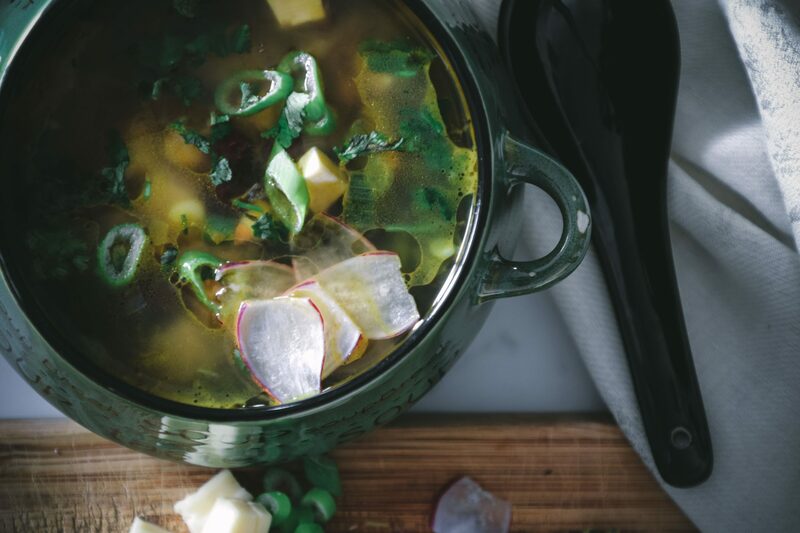 Adding paneer , adds a soft chewy texture to this soup. It balances out the overall texture of this soup . If you are on vegan diet, or do not want to add paneer for any reason, you can replace this with Tofu. For those who prefer chicken, you can skip adding paneer, and add cooked , diced or pulled chicken in this. 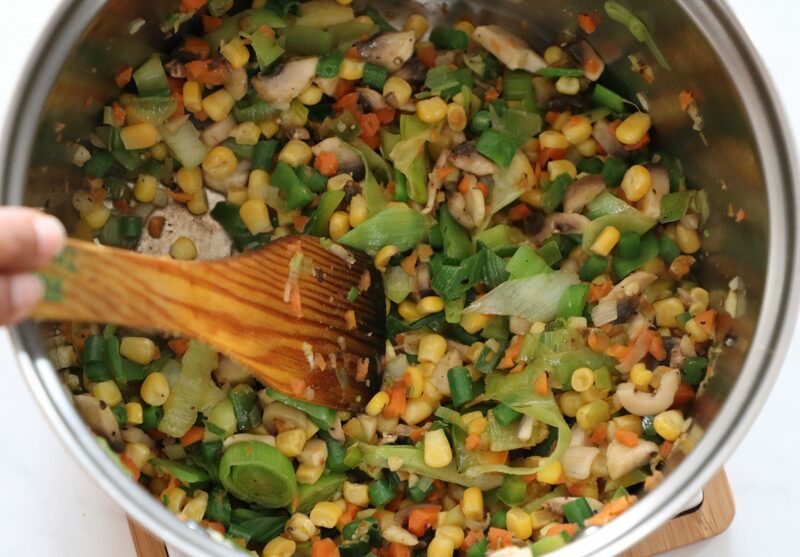 Apart from that, i would suggest using french beans, capsicum, carrots, and sweet corn for sure in this soup recipe. 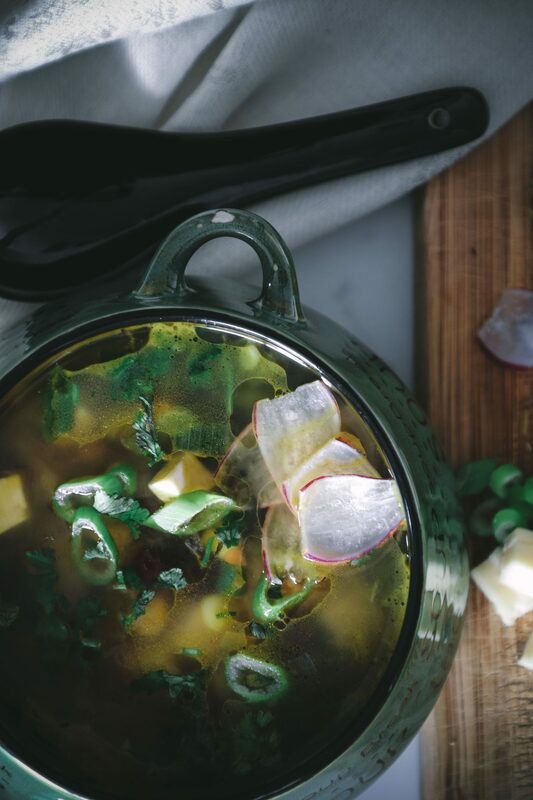 These veggies add that beautiful flavour, taste and crunch to this clear soup. Heat a little oil , any oil would do. I use either olive oil, or sesame oil.Slightly sauté ginger and garlic , in the oil for 3-4 minutes. Do not brown it. Add finely chopped spring onions, chopped mushrooms and sauté for another 3-4 minutes. Now add rest of the vegetables- leeks, mangetout peas, french beans, carrots, capsicum and red kidney beans. Drizzle a dash of white wine vinegar, and little soya sauce . Mix everything well, and add water.Add salt and freshly ground pepper as per your taste. Cover and let it cook for another 8-10 minutes. Uncover. Check for seasoning, and adjust it as per your taste if required. Soak these in enough water overnight. In the morning nicely wash and rinse them. Add these in a pressure cooker with double amount of water, and a little salt. Cook for almost 20 minutes on medium heat . Once done , sieve the beans and store them in an airtight container in the fridge. These stay good for 3-4 days. To serve, pour hot soup in a bowl, and add a drizzle of sesame oil. 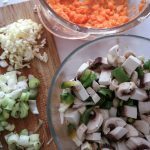 I love topping mine with sesame oil, because it adds a really nice flavour to my soup. If you have toasted sesame oil, all the better ,use that .Garnish with freshly ground pepper, spring onion greens, chopped coriander. If you like a kick of spice, add chopped red chillies, and sprinkle a few toasted sesame seeds. 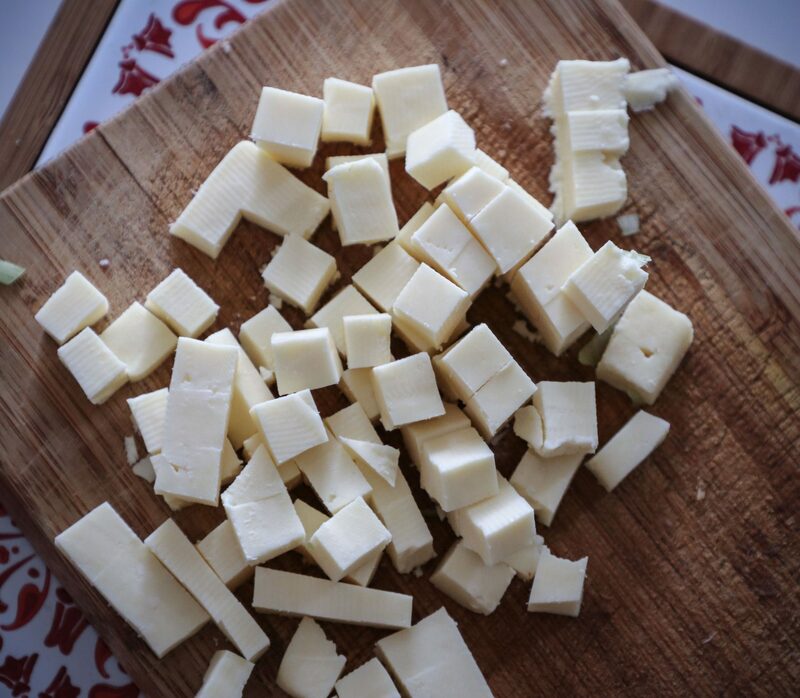 Serve it with a side of toasted bruschetta, or garlic bread. Enjoy this simple but healthy meal, with your family, and they are going to love you for serving this. Heat oil in a pan. Add chopped ginger and garlic, sauté for 2-3 minutes. do not brown. Add spring onions, sauté for 2-3 minutes. Add mushrooms. Sauté for 3-4 minutes. Add rest of the vegatbles , and beans and mix well. Sauté everything these for 3-4 minutes. Add salt and pepper, vinegar and soya sauce. Add 4 cups water. Cover and let simmer for 8-10 minutes. Serve hot, topped with sesame oil (or olive oil), fresh spring onion greens, some coriander.